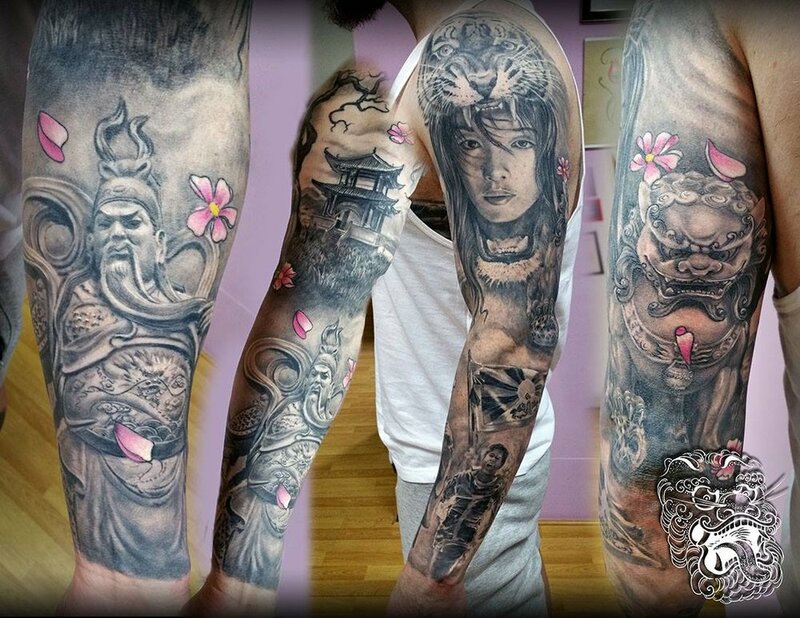 Sleeve tattoos — Malan - Top Realism Tattoo Artist working from Germany, Neuwied. Sleeve tattoos are very special. They are the first bigger size everyone considers. They became very popular recently. Walking in a short t-shirt, and showing your sleeve tattoo is a great moment. You immediately differentiate yourself from other people on the street. This sleeve tattoo I tattooed is a combination of elements that my customer expected. On a one element I had particular influence. Notice burning man with a Tibet flag behind him. This part is indeed a political statement. We liked this deeper meaning both, so this unusual tattoo was executed. From an artist point of view, sleeve tattoos are particular and hard to plan. Canvas is round and tall. While most of the designs that customers usually consider are in landscape orientation. Every tattooer has to find his own way to plan a sleeve. Myself, I love working with big demanding projects. Tricky to prepare, when appropriately designed they will look fantastic, and it is not uncommon for customers to come back often just to say how happy they are, and how often they hear compliments from their friend, and even others stopping them on the street. Decision to go 3/4 sleeve is usually driven by job environment. It is always wise to consider, how permanence of tattoos can influence your life. Music sleeve here, the main concern was realtion of objects and good flow. 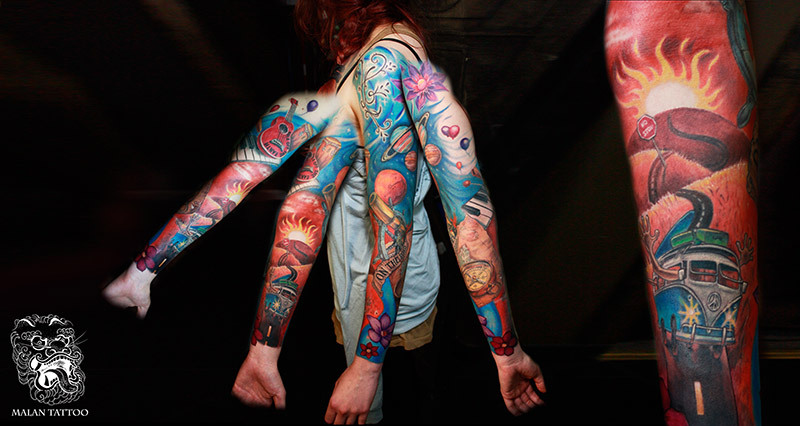 A sleeve is a big tattoo for its wearer, but if we consider the full body as a canvas, it is actually relatively small. It is definitely much smaller than a leg sleeve tattoo. Compared to the full front chest, or fullback, the sleeve is a really complementary piece. That is why, always when someone comes to me for a sleeve, I asked did they considered other significant art pieces. After all, a body is one piece of art. While black and gray sleeve can take anything between 30-35h, color will take significantly more to complete (average of 35-45h). Bigger coverage with ink, and more work is required. This sleeve I did, took us 10 sittings, each 4-5 hours. It is based on university chapel stainted glass. I also always say - size matters. Less and more prominent elements, clearly visible from a distance, are much better than 10-12 small pieces glued together randomly. Also, the sleeve looks best when it is treated as one piece, so by consequence subject matter should be the same. So, for instance, African lion doesn't go well with the dark street of London and Celtic legends. Stay within one subject matter, and the sleeve will be much better. 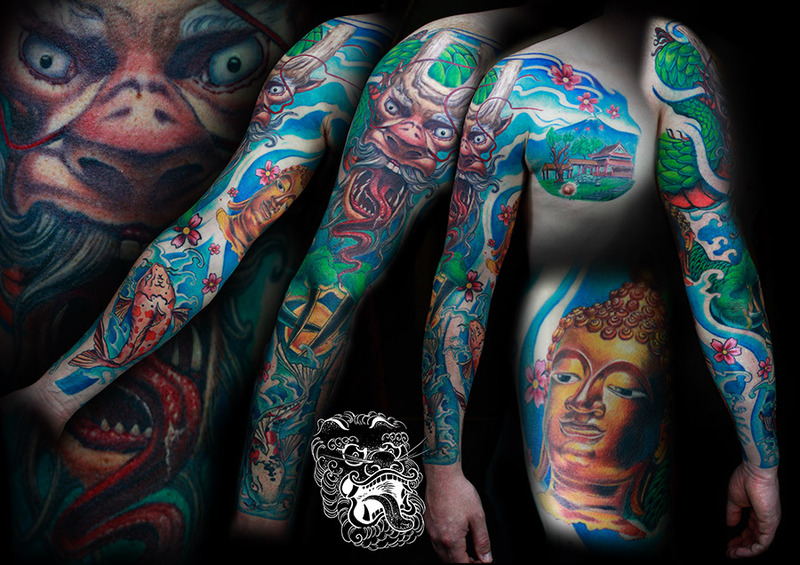 In this asian themed sleeve in full color, I would like to show You that form the very beggining of my tattooing I was concerned with flow and uniqness of design. All the elements I painted myself prior to tattooing. There is probably nothing more critical in the tattoo, and different to painting on canvas, then a flow. The flow is a rhythm of the piece, in which we try to complement natural movement of the body. It's muscle structure, the very essence of human proportion. And sleeve is really the first size of the tattoo, that can start working with that. Anything below is just a hope that next tattoo will follow the same rules, and flow will be achieved. But with sleeve tattoo, we are really able to complement body flow. Even this tattoo is not a full sleeve, it is 3/4 and only one side. But size of it allows already perfect flow consideration. Please notice how elements seem to sit naturally on the skin. Eveything seems to lead the eye towards next element. This is the difference that body rhythm makes.